J&J Snack Foods have been a grocery staple for decades. 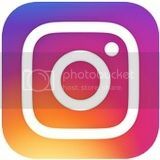 Some of their products are beloved must-haves in my household. One such product is Luigi's Water Ice, if you never had the Cherry or Lemon you are missing out big time. Recently J&J introduced a couple new products to the snack food arena. These taste as good as they look. I normally don't consume dairy products, but these really caught my eye and they didn't disappoint. They're really packed with fruit and they taste wonderful. I like these frozen, the texture is between ice cream and water ice so they're very refreshing. They can also be enjoyed as a drink by popping them in the microwave. They're 100 Calories and two weight watchers points. The perfect snack for the whole family. With out a doubt my preferred way of getting my daily serving of fruit. What can be more ingenious than a dessert pretzel? No need to visit the mall to enjoy a this sweet pretzel. 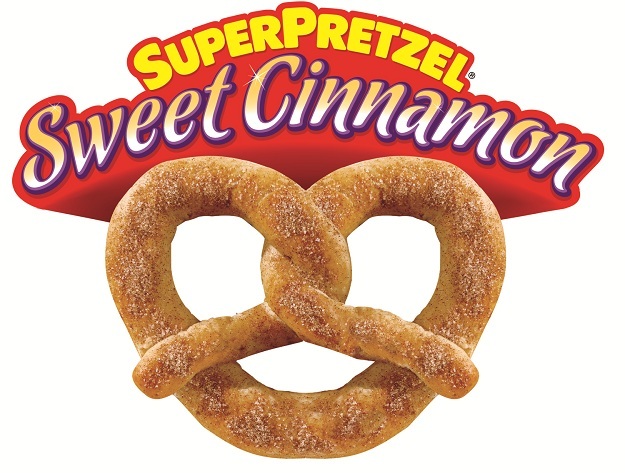 At 190 calories and 4 weight watcher point, Superpretzel Sweet Cinnamon is certainly a more diet-friendly alternative. 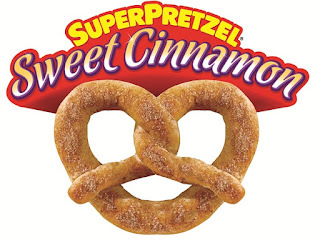 I'm a huge fan of regular Superpretzel, but I was disappointed that the Sweet Cinnamon contained aspartame Even though the aspartame is one of the last ingredients, it's still there and it makes me uncomfortable. I would really like to see these reproduced sans the aspartame. It just seems to be a superfluous ingredient that doesn't need to be included. I want to try the pineapple mango smoothie! It looks so good! My favorite are the original Superpretzels. I have never tried the Sweet Cinnamon, so my taste comparison is incomplete. My favorite is the Super pretzels. I believe these are also sold commercially at sports arenas. I would really like to try the Cinnamon Pretzels. thanks for the chance. I like the original soft pretzels and the soft pretzel bites! I really want to try those smoothies!! I think those smoothies sound really good! I love soft pretzels with cheese and now you are adding a fruit smoothie to it can't get much better than that. Thank you for a very delicious giveaway. Happy holidays to you and all of your loved ones and to all of your readers! i am lookin forward to using the cinnamon pretzels. The Sweet Cinnamon Superpretzels sound really good. I love cinnamon! The cinnamon pretzels. I love pretzels!! I am looking forward to trying both but the soft pretzels are my favorite! 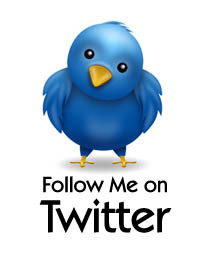 I am a big fan of food and I have to say everything up there at the top looks really delicious to me. Cinnamon is my favorite on pretzels omg!!! My fav. would be the pretzel bites with with marinara sauce. I don't find them at many stores but they rock. Love their little cheese-filled pretzels! I'm looking forward to trying the cinnamon pretzels. I want to try the Mixed Berry Whole Fruit Smoothie. The sweet cinnamon pretzels look delicious! I am most excited to try the Sweet Cinnamon Superpretzels. Thanks! I really want to try the cinn pretzels. My son would love them too. He loves anything with cinn flavor. The cinnamon pretzels are my favorite. My favorite are the Soft Pretzel Bites. I would love to try the Sweet Cinnamon Pretzels! the cinnamon pretzels look awesome! I like the original super pretzels..I really want to try the cinnamon sugar ones! My favorite J&J snack food is Luigi's Italian Ice-Lemon. I'd like to try the pretzels! I would love to try Cinnamon Pretzels! We like the original pretzels. I love Super Pretzels! I haven't tried the Cinnamon variety yet, but they look yummy! the strawberry banana whole fruit smoothies! I would like to try the SUPERPRETZEL SOFTSTIX. I'm looking to try the whole fruit smoothies! I cannot wait to try the Whole Fruit Smoothies! I've tried the pretzels before, but not the smoothies!